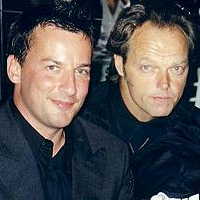 Craig Parker and Bruce Hopkins at an Oscar Party, 2003. Feb. 24: Craig took part in the NZ Sky City Celebrity Poker along with Mark Ferguson(LOTR: Gil-Galad, Witch King), Che Fu (rapper), and Pam Corkery (commentator/journalist). Craig ended up the big winner winning $3,000 for the Leukemia Foundation. He personally received a poker set and a bottle of Wild Turkey for his win and will return in the finals. Feb. 24: Craig is working on a new movie with Bill Nighy(Davy Jones-Pirates of the Caribbean). The movie is Underworld 3: Rise of the Lycans and is in production. Since the movie currently in production, not much info is known and data may change. Release date is given as 2009 only for now. Feb. 8: CRAIG'S NEW SHOW. There is a story at New Zealand Herald.co.nz about Craig's new half hour comedy series. The show is called Diplomatic Immunity and will be in 13 half hour shows. They are in production from March to May. Read more about it at the New Zealand Herald. Jan. 16: Imposter Alert: Craig informs me through my contact that there is an imposter at Facebook.com. The page is set up to appear to be him, but it isn't. Please be aware that Craig has no page on either MySpace or Facebook. Dec 25:Lingalad, the folk group who played at the Gathering of the Fellowship, have released a biography in Italian. It includes messages from both Craig Parker and Bruce Hopkins. Aug. 4: I've added a page for The Pillowman On it is an ad from the Weekend Edition of the New Zealand. I'll be updating the page as new stuff comes in. The play begins on Aug. 23 in Auckland. July 25: Craig had to cancel his appearance at Ring*Con Germany due to work committments. He explains his reason in a letter to Ring Con. Recently Craig signed on for a long term contract to Shortland Street filmed in New Zealand. You can still catch Craig in the Auckland, NZ play Pillowman Aug. 23-Sept.15. July 18:There is a new story on 'Pillowman' at Scoop.co.nz. Simon Prast is now set to direct the play that will feature Craig, Michael Hurst and Oliver Driver. If you didn't see Rosencrantz and Guildenstern, these guys make up the best team ever. This is a must see play for anyone in the Auckland area. July 7:It was reported in the Sunday New Zealand paper that Craig has signed on for a long term stint on Shortland Street. Welcome back Guy. ;) As a friend said, you never really leave the 'Street'. May 15:There is another interview/article for Craig about his return to Shortie Street at Stuff.co.nz called 'Guy Warner returns to Shortie'. Craig Parker returns to Shortland Street as Guy, who is now a self-help guru who sells how-to-parent books. A case for Dr Warner Craig Parker is returning to Shortland Street as part of the soap's 15th anniversary storylines late next month. March 25: IMPERSONATOR ALERT There is someone on Myspace.com claiming to be Craig. Just letting everyone know, he does not have an official Myspace page. If he were to start up some official site (which is unlikely), the links and info would be posted here. March 24: Craig is officially confirmed for Ring*Con 2007. For more information, please visit Ring*Con's official site. March 23:On March 10, Craig was a part of AK07, Auckland Festival 2007. He participated in the opening event, A Little More Light. For more on the event, visit AK07 opening night at the official website. AK07 is a celebration of the arts and theatre. Michael Hurst and Oliver Driver are also a part of the many events. Nov. 24:Craig has been casted in the ATC production of the Pillowman.This play will run at the Maidment Theatre in Auckland, New Zealand Aug. 23-Sept. 15, 2007. Michael Hurst will also be in this play. Visit the Maidment Theatre's web site for ticket information. Aug. 6: I've made a Filmography page for this site here. It contains TV, Film, Theatre, Short Films, and Conventions Craig has done. July 30: I've been meaning to post this, it was in the New Zealand Listener June 24-30 issue. Here is a link to the online article at the Listener site, Upfront: Craig Parker. I've also added a copy of it on the Articles page of this site at Up Front: Craig Parker. In case it gets moved on the Listener site. June 9:Craig is scheduled for Ring*Con Germany November 10-12, 2006. Visit the RING*CON web site for info on tickets. Also confirmed for this con are Mark Ferguson and Elijah Wood. May 25:Craig will be doing the play Glide Time, at the Silo Theatre, June 14 - June 29, 2006. April 18:I've changed the dates Craig will be doing the play, but the play itself will run to July 1. Craig will be appearing at the Gathering July 1-July 4, 2006 in Toronto, Canada. Someone else will be taking his role in the play for the last two days. If you have a chance I'd suggest seeing the play. It is a comedy directed by Oliver Driver(Rosencrantz and Guildenstern, Serial Killers(Nz TV)) and also stars Stuart Devenie(Hercules/Xena) and Theresa Healey(Shortland Street) among some other kiwi actors. April 17:According to the Silo Theatre Site, Craig is listed to be in a play called Glide Time. The Silo is located in Auckland, New Zealand. The dates are June 14 - July 1, 2006. Visit the Silo's Web Site for more information. March 11:There are reports from the Prop World Sweden con at Craig Daily Live Journal. There are some links to photos from this con also. Febuary 25:Craig has been confirmed for The Gathering of the Fellowship in Toronto, Canada July 1-4, 2006. I will be there working with Bruce Hopkins. Also at the convention will be artist John Howe, Cliff Broadway and Tolkien scholars. Nov. 12: Found another review with a photo of Craig and cast in Serial Killers. BBC.co.uk/derby/ Also, if you haven't seen, there are more new photos at the Derby Playhouse web site. There is a photo of Craig as another character in the play, from the play's TV Soap 'Heart of Hearts'. He is listed as Dr. Charles. Nov. 5:Serial Killers is a hit. Read the review here at The Stage (http://www.thestage.co.uk). This link goes directly to the review, if it doesn't you can find a link to the review on The Stage's home page. Nov. 5: Ring Con-Lexicon has put up some audio interviews with the guests including Craig. You can check them out here: Lexicon Do's and Don'ts' interviews. Play synopsis: When soap-star heart-throb Andrew Lomas learns that scriptwriters are planning to write him out of the show he takes the storyline of �Heart of Hearts� into his own hands. A new comedy that looks at the absurdities of life in an Australian soap and the lives and loves of its cast and crew. Oct. 2:There is now a site for those going to Ring*Con Germany with info on things you need to know for the convention. It is at Ring*Con LexiCon. It is a guide to the convention. This site is in English and is being translated from German. Aug. 28:A report on the first day of the Fellowship Festival is now on their site at 1st. Day at the Festival. It sounds like they are having a lot of fun. If you have photos from the Festival of either Craig or Bruce Hopkins that you'd like to share with my site or Bruce's site (Bruce photos only), you can email them to me at jmsstyxnyes@yahoo.com Please include a phrase in the subject line pertaining to the Festival so me and Yahoo don't mistake your email as Spam. If you can, send the photos in 640X480 or larger file format size. Bruce should have something for his site after both Dragon Con and Fellowship Festival, so be sure to keep checking his site for updates. bruce-hopkins.com. Cheers, Jmsstyxnyes. July 14:Craig's chat thread is here Fellowship Festival forum. A transcript will be made soon by the FF forum. July 7: In regards to the London bombings, Craig has emailed my contact to say he is OK. My prayers go out to all those effected. Cheers, Jmsstyxnyes(Janet). June 29:Some fans have been wondering about the state of Craig's merchandise page. I got this info from him. Craig has decided to take his merchandise website down for now. He has no real plans for restarting it, but he may have some of the merchandise for sale at the two conventions he will be doing. If your site has any links to the merchandise site, it would be a good idea to take them down and maybe post a small message that he has decided to remove the site, but items may be sold at conventions he attends. May 3: Ran across this site that had a nice bio on Craig. Craig Parker- Speakers New Zealand. It is a site for enquiring about Nz Speakers for an event. The bio seems to be from 2003 when Craig still lived in New Zealand. It can be expected that his newly won fame will not change Craig as a private person. He already has experienced the fact that the press sometimes tends to alter stories and quotes as they see fit. "A quote can be made to mean anything and in their photo sections there's a lot of innuendo. When that first happens you worry about how people who don't know the situation will read it, how your family will be affected by it", he says. This is why, as Craig puts it, he handles the media with a good deal of "healthy distrust". "It really pays to keep your private self for the people you like and love. It does me no favours at all to reveal my personal life to people who read magazines." April 9: Craig is confirmed for the German Ring Con, Ring*Con 2005. It will be held this year at the Esperanto Hotel Fulda, Germany on October 7-9,2005. Visit their official site for more info on tickets, events, and list of other guests. March 27: Live in the USA? Need to order the Lothlorien gift set with Haldir, Toys r Us (Amazon.com) has it available now for pre order for a May 1 release. There should be sites for other regions to order. Ebay dealers also have some sets, but their prices are higher. March 15:***IMPERSONATOR ALEART*** This from the moderator of the Craig Parker Fan Board: "There is a Craig impersonator out there. He/She is posting on a Craig/Mark/Bruce message board. He's not doing too much except fooling a bunch a fangirls. The impersonator goes by the name peanutbutteredcp." Reminder, Craig absolutely does not go on chat/message/fan boards or fansites. Anyone posing as Craig, Bruce or Mark should email me or Bear of Craig-Parker.net and we will alert the proper people. Febuary 19: Updated info on the newest Haldir figure, the pack is called the Lothlorien Gift pack and includes Haldir in Lothlorien cossie, Galadriel, Celeborn, Frodo, and Aragorn. The set is due to be released in the US sometime this year, but is now available from the Philippines via Ebay. Jan. 23: There is a mention of Craig in this article from the Toronto Star. The article is a review for the Japanese resturant Japango. Jan. 23: I just recently returned from the One Ring Celebration (ORC CON) in Pasadena. Though Craig was not at this event, I do have some close up photos of Elijah Wood, Billy Boyd, Sean Astin, John Rhys-Davies(coming soon), and Bruce Hopkins at Bruce's Official Site. I will be adding more photos in the weeks ahead. Dec. 12:Just found at the Fellowship Festival site that Craig and Mark will be co hosts at the 2005 event. From the site:" We are proud to announce that Craig Parker (Haldir) and Mark Ferguson (Gil-Galad) will once again host and MC The Fellowship Festival 2005. Craig and Mark did a fabulous job at the first Festival, having us rolling around the floor in laughter at their antics. Be prepared for more craziness from the gorgeous duo." Dec 3:Final Update on the Hurricane Recovery Fund Ebay Auctions. We managed to raise a little over $350 :). A Big thank you to all who bid and those that won. Our future auctions will be for TAPAC(The Auckland Performing Arts Center). Check Ebay from time to time as my friends have more Xena prop costumes to put up. Nov. 13:Got word that Craig was on a TV show 'Front Seat' that aired in Nz. About the show: 'Oliver Driver was in London and he visited Craig and Rebecca Hobbs briefly who both said they were working and ran off. Next scene is Oliver discovering them selling roasted nuts from a food cart! Nov. 1:Craig has been confirmed for London Film and Comic Convention. Wembly Exhibition Centre. London England, November 6 -7, 2004. Craig had told me about this at Dragon Con, but since he couldn't give me a green light at the time,I couldn't announce it till it was official on the con site. Hope this one goes better than Masters of the Ring Con. Sept. 15:Added the list of Well-Mannered Celebs from the New Zealand Herald print edition to the Dragon Con '04 Page. This is a scan from a scan my friend sent. This list, as far as I know, was not on the Online Herald edition. Sept. 12: I added more photos to my Dragon Con page. More photos coming as I get them uploaded. Soon I will be getting Bruce's photos up as he gets them to me and more information on Operation Read to his web site. Aug. 30:Ian Smith has some photos and an interview with Craig from the Fellowship Festival at his site: Ian Smith's Personal Web Pages. Aug. 9: The Official Photos for BOBW23 are now up at Peter Fallon's Web Site. Peter is the official photographer for Best of Both Worlds Conventions. Aug. 3: Craig has been confirmed for Atlanta's Dragon Con. Atlanta, Georgia, USA. Sept. 3-6, 2004. I am planning on going, so look to this site for updates after this con. TORN has a Schedule up showing Craig's times with their activities. Also scheduled for this huge con are Sala Baker and John Noble. If you are a Doctor Who fan, I also see Peter Davison (Doctor number 5 and Tristen from All Creatures Great and Small) will be there, though not a part of the TORN activities ;). April 11: Relisting a link I deleted by mistake for photos from the plays Rocky Horror Show and Rosencrantz and Guildenstern are Dead from John Parker's web site. John is the set designer for some of Nz's plays and also is a Ceramics artist. March 20: Mercy Peak has finished it's series run. After six seasons from 2001 to 2004 it has been a wonderful show and I will miss it. Now as it ends the actors have given some of their memories of their best episodes on the Mercy Peak home site. Craig had this to say about one of his favorite episodes to film: "Way back in the first series we shot an episode called Lazy Sunday Afternoon," says Craig Parker. "It had car crashes, fireballs and rescue helicopters. And while all this madness went on around, I spent the episode sitting next to a badly burnt man, beautifully played by Bruce Hopkins, and chatted about life and love as he lay dying." March 20: Photos from the Best of Both World 21 Con can be found at Castle Software (Peter Fallon's web site). These photos are also available for sale from the photographer. Just click the link to BOBW 21, photos from BOBW 19 are there too. February 21: It was mentioned on the LOTR Fan Club message board that Craig made an appearance on the UK QVC channel during a LOTR merchandise show. January 11: Mercy Peak will be starting its final 10 episodes Jan. 16 in New Zealand on TV One. Check the Mercy Peak home page for episode details. December 29: Craig is confirmed to appear at Best of Both Worlds 21 in Canberra, Australia along with Dominic (Merry) Monghan, David (Barliman Butterbar) Weatherly, and Jorn (Rumil) Benzon. October 31: Craig, along with Mark Ferguson, will be at the Memorabilia Con in Birmingham, England. November 29 - 30, 2003. Visit the Convention site for more details on tickets and venue. October 31: Michael Hurst, director of Craig's Xena episode, 'To Helicon and Back', and Iolaus in Hercules and Xena has won an award from Fourth Annual Arts Foundation of New Zealand Laureate Awards. This is a highly prestigious award and well deserved :) Congratulations Michael. If anyone would like to read more, you can go to my NZ Adventures Page, or Michael Hurst Now.com for more info and up to date news on what Michael is up to. Craig confirmed to the London Expo '03 for October 18 - 19, 2003. This event will be held at ExCeL Convention Centre, Royal Victoria Dock, London, E16, UK. Also scheduled for this event is Billy Boyd. October 8: Article in NZ HERALD mentions that Craig was at the AK03 festival Oct. 5 taking part in the blessings of the animals. Quote from the Herald: "Mercy Peak star Craig Parker read the Prayer of a Cat. "If you have by chance in some celestial realm, a little white mouse or a saucer of milk, I know someone who would relish them." SPCA of Auckland and related news mention. Oct. 3: Mercy Peak has finished this season's episodes and will return in 2004 for the final 10 episodes which will complete the series. A total of 60 episodes were filmed and the final 10 will be played in New Zealand. Keep watching the Mercy Peak Home Page for updates for the starting dates for the episodes. Also, synopsis for the series can be found there. Craig will be doing conventions, looking into new horizons and traveling more in the coming year. I will do my best to keep this site updated with his new projects. Sept. 16: Photos from Istrocon 2003 can be found on their site under FOFOALBUM 2003 by Milo� Lacika. A couple of interesting trivia items from Craig as reported by Penngaladiel of Craig Parker, first Hungarian Unofficial Fansite from the Istrocon convention. Craig was the voice of the Nazgul that says the line to Arwen, "Give us the Halfling, She-Elf". As well as providing some of the screams of the Nazgul. He is on the FOTR Extended DVD under Storyboards, he voices Frodo in an early read through for the movie. Also while in Slovakia, Craig visited Radio Twist. There are a couple of photos at their site. September 6: Ron Cleveland of Ring Con in Tacoma, Washington confirmed that Craig will be attending the convention that runs from Oct. 24 to Oct. 26. Also scheduled for this con are J�rn Benzon (Rumil, brother of Haldir) and Bruce Hopkins. Aug. 22: TV AWARD NEWS: Craig didn't win the Best Supporting Actor, the award went to Charles Measure for Street Legal, but in his acceptance speech he said "Craig and Joel (Tobeck) you ROCK!" :) If you remember Alison Bruce was in this catagory, that was a newspaper typo. She did end up winning Best Actress for Mercy Peak along with Jeffrey Thomas winning Best Actor. Mercy Peak only won those two awards that I could see. For a complete list of the results, visit the New Zealand Herald . I think they are all winners just for being nominated :) I can't say I've ever believed in award shows. July 25: Craig is confirmed for RingCon 2003 to be held in Bonn, Germany November 14 - 16, 2003. Also confirmed for this convention are Bruce Hopkins and Mark Ferguson. July 25: Just heard from a friend, Craig is listed in the Magazine Nz New Idea on their 'A' List of people in New Zealand. :) Good on Craig, but he has always been 'A' list with me since I saw him in R and G ;) Michael Hurst was also on another 'A' list just recently. I will have more on that article when my friend finds time to scan it or type it up. The Awards will be presented in Auckland August 22,2003. July 10: Just got back from New Zealand and I will be updating soon with some photos from older magazines I found. Craig was unable to attend Winterfest due to location filming of Mercy Peak. He tried to contact me to arrange a get together, but we missed each other. I was at the Great Debate and Oliver Driver carried the show, though I felt Craig was missed. Radar was very funny, but I would have loved to have seen Craig and Oliver on opposite teams. This debate was not filmed or recorded in any way. I did meet with Bruce Hopkins many times and we will be updating his site soon with new photos. He is such a sweet man. He is currently in rehearsals for MacBeth, in which he is playing the title role on stage at the Silo in Auckland. I got to see some of the rehearsals and it looks like it is going to be a great play. If you live in the area, you really need to check this play out in August. Details are at his site. I was also able to meet with Michael Hurst and his wife at the TAPAC(The Auckland Performing Arts Center) opening. I will have photos here soon of me with the TAPAC gang(Iolausian fundraisers), Michael, his wife and Bruce. I wish there were some of Craig, but maybe next time. I am considering going to Toronto for the Gathering of the Fellowship in December to see Craig and Mark Ferguson there. Mark did mention he and Craig are scheduled to be there and will do a reading for children. If you are going to Toronto, let me know and maybe we can meet up. When I do cons, I'm known to drag along a small cossie show with me ;) I may bring a couple of things that will make it past security at the airport. I won't be bringing my swords. Concerning Mercy Peak, the show is filming now to September and is slated for a 60 episode run. No word on episodes beyond that, though it is always possible is will get extended. I have no official information on this. But it seems to be very popular in New Zealand. DVD pre orders are now being taken for an Aug. 26th release of the theatrical version. You can find out more by visiting THE LORD OF THE RINGS OFFICIAL WEB SITE Special Extended Edition of The Two Towers is set for a November 18th release. There will be 43 minutes of unreleased footage and two bonus disks with all new material. You can now pre-order the Helm's Deep Action Figure set from an Amercian dealer, Entertainment Earth This set includes the Haldir doll. It is listed for a September release and priced at $29.99 US. Also available for pre-order from KBtoys.com , Action Figure Xpress.com and EToys.com Lord of the Rings: 3" Haldir, Elf Soldier and Elven Warrior Action Figure 3-Pack from Art Asylum. This set is due to be released Oct. 1, 2003, date subject to change. 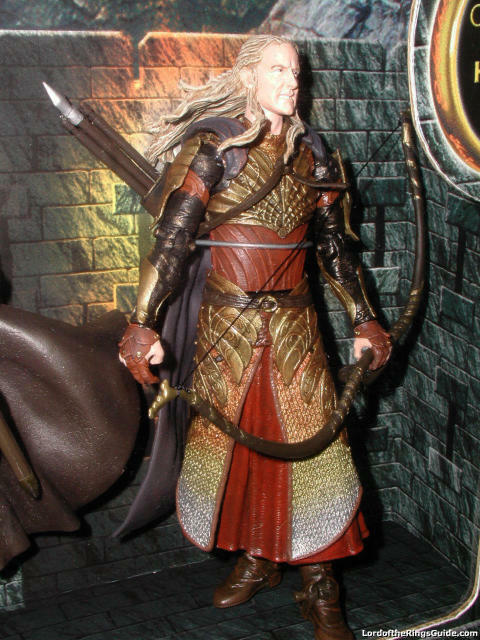 Photo of set with Haldir from the Action Figure Xpress web site. Craig, along with Mark Ferguson, is confirmed for The Gathering of the Fellowship in Toronto, Canada Dec. 15 thru Dec. 17. Craig emcee'd a dinner for a world peace cause event May 23, 2003 in Auckland. No further info available. Oliver Driver will be at the Queenstown Winterfestival along with Mark Ferguson this June. I will be also attending this festival in June and will post updates from there. I will also be in New Zealand from June 11 to July 8 for Michael Hurst's play, Hamlet, the grand opening of TAPAC and for general site seeing :). Voice-Over news: Craig's voice was heard in New World Stores in New Zealand in a recorded ad. And he can also be heard on the Tv commercials for the store. Some photos from the Oscar Parties held the week of March 23 are now up at Bruce's Official site they are accessable through his Image Gallery Page under Oscars Parties 2003. He was at several parties during the week. These photos come from Rebecca Kirkland. There are a couple of great photos with Craig. There are more to come. Craig was at the Oscar Party held by TORN March 23 along with a couple of other parties the days before. He was there along with Bruce Hopkins and some other well known LOTR stars. A report of that party and others is now available at Bruce's Official Site in Bruce's own words. Since the TORN party was sold out, I was asked not to announce this before hand. I now have some photos at Oscars Parties 2003 page and there are some more at Bruce's Official site. As for Bruce Hopkins, he will be attending the Collectormania Con May 2 to May 5. He is also doing the Elf Fantasy Fair convention in Holland April 26 and 27. Those details are posted at his Official site. Just added, Bruce is confirmed for Ring*Con 2003 in Germany along with Mark (Gil-Galad) Ferguson. Craig was on the travel series 'Intrepid Journeys' that showed on New Zealand's TV One. You can read his travel journal at NZOOM.COM complete with his photos. A very good read. Craig and Bruce Hopkins are doing voices in the newest Power Rangers shows, Ninja Storm. Craig is in the episodes 'Prelude to a Storm' as the voice of Blue Face and 'There is no 'I' in Team' as the voice of Mad Magnet. According to Bruce Hopkins, who is the voice of Choobo, they have been working together in the voice loop group. The Power Rangers can be seen on ABC Kids network, Saturday mornings at 11:30am EST. Check local listings for times in your area. Craig's voice can also be heard on NZ TV doing voice-over commercial ads. It has been reported that some have run while Mercy Peak was on. Craig is reported to be currently filming for the next series of Mercy Peak through September. Mercy Peak is now showing in Canada on W Network. Check local listings for times, or visit their web site for more information. This is a photo of the doll to be released in a package set from Toy Biz. Click to enlarge photo. SciFiWarehouse Pre-orders can be made at sci fi warehouse now. 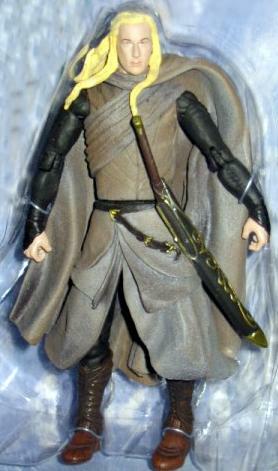 A three inch Haldir figure will be released 8/01/03 by Play Along Toys. This, part of a set with other characters. Here is more info on this figure. The site Craig Parker, the Actor Behind Haldir, officially went online January 5, 2002. Two of the pages on Craig went online prior to that in 2001, Rosencrantz and Guildenstern page, June 4, 2001 and The Queenstown Great Comedy Debate, Sept. 18, 2001. Also available for purchase: The Tommyknockers DVD/VHS.Craig has a small role as a student bartender. Out now: the theater release of The Lord of the Rings: The Fellowship of the Ring on DVD and VHS. Also out: The special extended version of The Lord of the Rings: The Fellowship of the Ring on DVD. It contains 30 minutes of extra unseen footage, including more of Haldir. Pre orders for The Two Towers DVD theatrical release will be taken soon at the LOTR site. I'll post a link when it becomes available. The Two Towers was being shown on Air New Zealand flights in First and Buisness classes during April on the LA to Auckland flight.